What does 1910, Old Opera House, Law Enforcement League, Black Hand Letters, Alva, Oklahoma, Mabel Oakes and Justice of Peace Nelson L. Miller have in common? This was a time when… female purity was regarded as a virtue to be protected. Social standards & dress were according to what was expected and morally correct in society. Women still wore the tight fitting, laced corsets, but there was a change, debate in the air as to if it was a healthy, safe garment for women to wear, confining, restricting their upper torsos. The skirts were to the ground; the coats were below the knees; and the blouses necklines were up around the neck. The “Law Enforcement League” was established, funded for the purpose of enforcing local moral standards, whether they dealt with booze, kissing in motion pictures, separation of races, or investigating backgrounds of newcomers to be sure they were morally acceptable to ruling town fathers. 9 November 1910, considerable excitement was buzzing through government square of Alva, Woods County, Oklahoma. Those favorable to the democratic cause were keeping their eyes, ears glued to the election postings at “Jesse Jackson’s Cigar store,” on the west side of the square, College Avenue, north of Monforts Drugs. 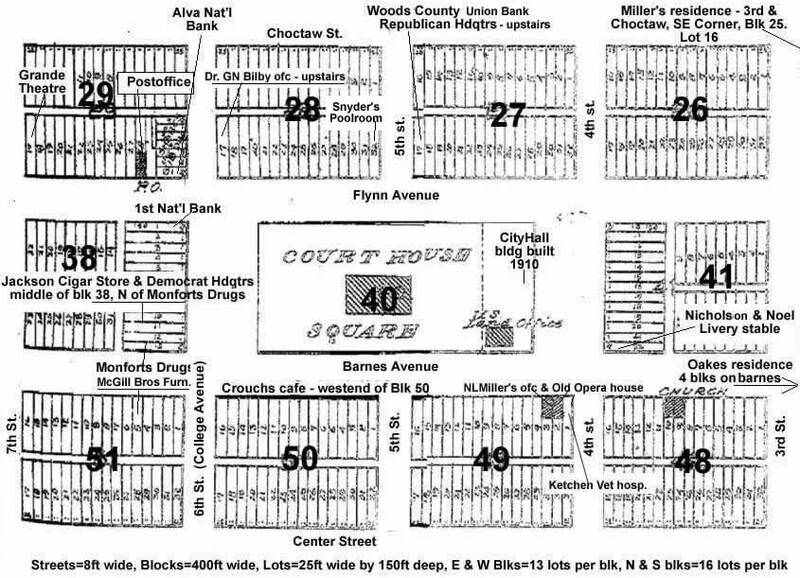 On the North side of the square, those favorable to the republican cause were doing the same, upstairs in the two-story building of the “Woods County Citizens Union Bank,”northeast corner of 5th Street & Flynn Avenue. This 1910 fall day was to go down as “A Day of Black Infamy” for this northwest community. Sometime between the hours of 12:00 p.m. and 3:00 p.m., November 9, 1910, Mabel Oakes was found dead in the “Old Opera House” around 3:30 p.m. by Justice Miller. Memories of that fall day will linger in the archives, with Mabel Oakes’ side of the story buried with her in the Alva cemetery. Mabel Oakes was a young, country girl (23 years) living on Barnes Avenue, four blocks east of the southeast corner of the square, with her parents, George & Carrie Oakes, and a younger brother, Clarence (15 years). Through testimony, transcripts we find that Miss Oakes was a large, sturdy, supposedly healthy woman of that time weighing around 160 to 165 pounds. Miss Oakes was also 5-months pregnant at the time of her demise. She wore a tight fitting corset and a scarf wrapped tightly around her tall neck. Miss Oakes explained to others the reason for the scarf tightly around the neck as a throat problem. In 1910, Miss Oakes was known for her fainting spells for which she took prescribed medication of strychnine and morphine tablets. Were these fainting spells the cause of her broken arms, black eyes and bruises about her face? OR... her pregnancy? OR... were the fainting spells brought on by a heart condition or a tight fitting corset used by Miss Oakes to conceal her pregnancy that began in the early summer of 1910? OR... were Mabel's unfortunate accidents of broken arms, black eyes and bruises the cause of "Black Hand Letter" threats? Only Mabel Oakes memories of that time will tell us the whole truth. Those memories lay underneath the northwest Oklahoma soil, in the Alva Cemetery, in the Oakes family plot. The spring of 1909, Mabel began to work for Justice Miller as a stenographer at his offices in the Old Opera House. Mabel did various work learning to write on the typewriter, answering correspondence, drawing up other legal papers for Miller. Miss Oakes worked for Miller on and off. At her father’s insistence, Mabel quit three weeks before her death. In the spring, summer 1910 Miss Oakes began receiving “Black Hand letters” (40-50) anonymous threats. Mabel would share these threatening letters with Justice Miller for safe keeping and protection. Did all these “Black Hand letters” lead up to the death of Mabel Oakes? On Wednesday, November 9, 1910, Mabel left her parents home before 11:00 a.m. and says, “Mamma, I will be back pretty soon. I am going down to see Mr. Miller. I will be back pretty soon.” That is the last time Mabel was seen alive by her mother. Mabel’s father, George W. Oakes, last saw his daughter alive, November 9, 1910, a little before 9:00 a.m. at home. At eleven o’clock that same morning, Mabel arrived at Justice Miller’s offices in the “Old Opera House” to collect past wages that he had promised her after she had quit work. Miller asked her why? Mabel said “He absolutely don’t want me in your company any more.” She said she would be all right in a little bit and that she would go home then. This was the last time Miller saw Mabel alive. Nelson L. Miller… In 1910, Miller was head of household residing in Alva, Oklahoma. On September 5, 1888, Miller (born 1859), married Rachel (born 1863). The Miller family consisted of: Lois, born 1888, Kansas; Eva, born 1891, Kansas; Minta, born 1892, Kansas; Bert L., born 1898, O.T. ; and George, born 1902, O.T. Let’s journey through time to September 1911, to the Woodward County courthouse and see if we can catch an interview with Nelson Miller and get his side of the story. What are these “Black Hand letters” we’ve heard so much about and was there anything sexual between you and Mabel on that infamous spring 1910 buggy ride? In our interview, Miller stated that he and Oakes passed on through the big building, into Miller’s office. Miller went to the telephone and called the sheriffs office, but got no answer. Miller told Oakes that someone will have to go notify them. Oakes was the one that left to get Sheriff Hugh Martin. Miller explained, “Judge Lawhon was walking up the sidewalk from up town, I called him and we talked until the crowd came from the court house.” That concluded our private interview with Nelson Miller during the court break. Justice of the Peace, I. B. Lawhon, coroner, called in three local doctors: Dr. G. N. Bilby, Dr. O. E. Templin and Dr. Elizabeth Grantham to do an autopsy, November 9, 1910, between 3:00 and 4:00 that afternoon. Dr.’s Bilby, Templin and Grantham autopsy reported that rigo-mortis had not set in when examined. The body was not stiff and the lungs were not normal but were very black. Death resulted from strangulation, caused by the silk scarf drawn tightly about the neck. The doctors removed Miss Oakes five month old fetus, preserving it for future evidence. Miss Oakes death was estimated between the hours of 12:00 a.m. to 3:00 p.m.
For Miller’s Defense team in the Woodward County, case #714, we have Judge L. T. Wilson; C. H. Mauntel, whom stepped down after the change of venue; J. P. Grove; and Charles J. Swindall, Woodward attorney. Our research of the “Old Opera House Murder” has been through old newspaper archives; copy of N. L. Miller vs. State (600+ pages of Transcripts); 2 December 1910 Woods County Case #612; 7 Sept. 1911 Woodward County Case #714; and 26 April 1913 Appeal No. A-1618 from the State Library Archives. 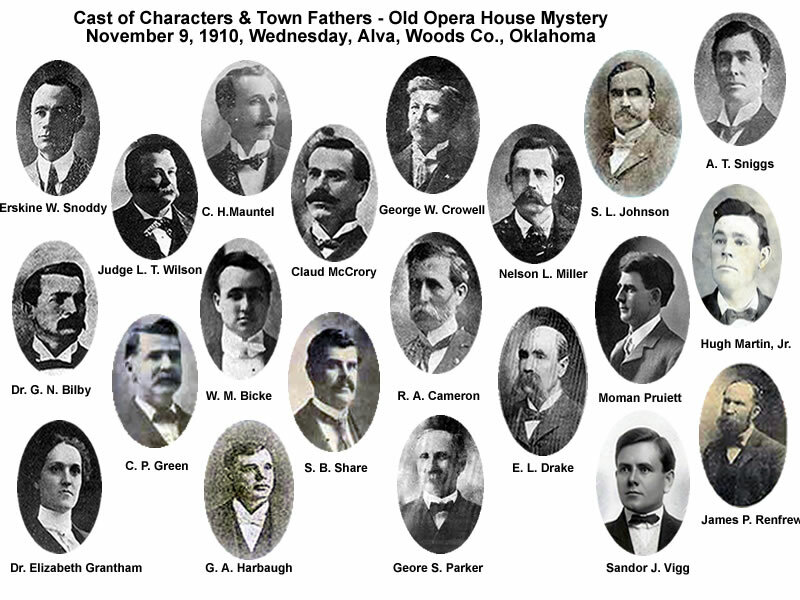 You can view the cast of characters, full testimonies, filings on our website at “The OkieLegacy – Mystery – Old Opera House Murder” – http://okielegacy.org/mystery/.